Just the other day we skipped through Dapayk & Padberg’s album previews again. And we were pretty surprised. It seems as those two wanted to save some great tracks for the next album. There’s no other reason why we would have missed „distracted“, this fantastic up-front a-side-track. 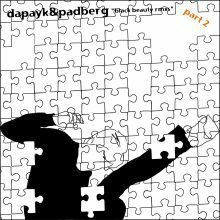 Or perhaps we did not overlook this piece, but were distracted by the concept of their „black beauty“ album – far away from conventional minimal genre clichés. The second remix on the record is „khes“, whose original most people considered the club hit of the album. Now, Digitaline from Switzerland present a less vocal, more groove-oriented minimal version. While mostly playing around with wooden percussion sounds, every now and then they throw in some bits and pieces like tiny cut-up vocal snippets. But not randomly – just in time and not too much. If you like the analogy or not… the track matches Guido Schneider’s „theiss“ remix (black beauty rmxs pt.1) perfectly. A MUST!